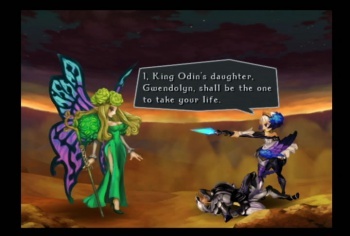 PSN will soon be home to God Hand, GrimGrimoire, Odin Sphere, and other offbeat favorites. Cult games used to follow a predictable arc: get released, get mostly ignored, and then slowly fade into obscurity as the fans weep. Digital distribution gives cult hits a second chance chance at life, and Sony wants to do its part to help. On October 4, Sony will launch the "Only on PlayStation Network" initiative, which will wheel out exclusive content and price promotions on a weekly basis. Its first offering will include a number of peculiar PS2 titles, marking the first time that PS2 games will be available for download on PSN. Susan Panico, senior director of PSN, has promised a selection of "rare classic games," including God Hand, GrimGrimoire, Maximo: Ghosts to Glory, Odin Sphere and Ring of Red. Panico did not detail prices for these titles, although gamers who spend $60 on PSN content in October will get $10 towards November content. "Only on PlayStation Network" will also cater to players with newer tastes, promising former PC exclusives like Eufloria and DLC for Sony titles like Infamous 2. These five titles are currently the only PS2 games revealed for PSN, but that will probably change. Now that Sony has gotten over its initial reluctance to sell PS2 games as downloadable purchases, the "Only on PlayStation Network" promotion might open the floodgates for a whole library of PS2 hits (and near-hits) that gamers missed the first time around, or just want to play again. Expect further information as the promotion gets underway.